Happy Bloggers Challenge Friday! As you can tell from today's title - it's all about birthday's today! You know I usually issue a birthday challenge when I need to create one - and today is no exception, it's my DH's Birthday! So, I'm taking a break from my Christmas postings to share the card I created for his special day....Check back later as I do have a card to celebrate the start of Hanukkah. 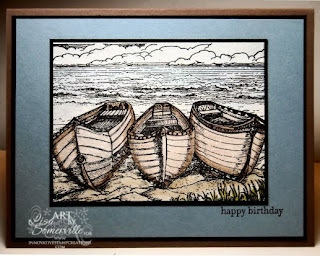 I just love this image from Innovative Stamp Creations, the scene is so peaceful. The image is stamped in Black on Watercolor paper, then colored using the Marker Watercoloring Technique. The sentiment is from Stampin' Up! 's Teeny Tiny Wishes. Looking for more birthday inspiration, be sure to click the Bloggers Challenge Logo on my sidebar to see what the talented Challenge Players created this week. Thanks for stopping by - stay warm and have a great weekend! So calm and peaceful...great break from the holiday rush. Nice soft card, Lisa - I'm sure your hubby will love it! Happy Birthday to him! Love the boats in this card. Men are so hard to make cards for. My birthday card for the challenge was easier. A card for my mother in law. Pretty cool, your DH and I share the same birthday! Beautiful card...and here I was hoping it was for me! LOL! Great masculine card. The image looks so nice and serene. I love boats anyway and these are great -- your background is super cool too! I just love when you watercolor and use black in your design. The soft colors just pop right off the card! Beautiful card- and a great image for a guy card. Hope your hubby has a great one! Beautiful, beautiful maker water coloring! This is so cool! It's so hard to make masculine cards sometimes, but you hit it here! Beautiful work Lisa! You've created a great guy card! It is such a serene scene! Beautiful soft colors. Happy Birthday to your DH! Fantastic male card and so very peaceful. Wonderful masculine birthday card. The scene is very peaceful. Nice masculine birthday card, Lisa. Very peaceful card--wish it was warm enough for a boat ride! Yours is great! Cool card. I bet Jim loved it!